Omega believes in the three ‘R’s to tackle the problem of waste generation. Paper recycling is one of the methods that we use to reduce our carbon footprint. It uses less energy, water, and produces lower carbon emissions than the manufacturing of non-recycled paper and at the same time reduces the amount of waste to landfill – as paper can be recycled 4 to 5 times. Recycling one ton of paper can save 17 trees, 7,000 gallons of water, 380 gallons of oil, 3.3 cubic yards of landfill space and 4,000 kilowatts of energy, enough to power the average Indian home for six months, and reduce greenhouse gas emissions by one metric ton of carbon equivalent (MTCE). The Omega Paper Plant is a manifestation of the school’s commitment to being a sustainable and green campus, and therefore to reduce the waste generated within the premises. 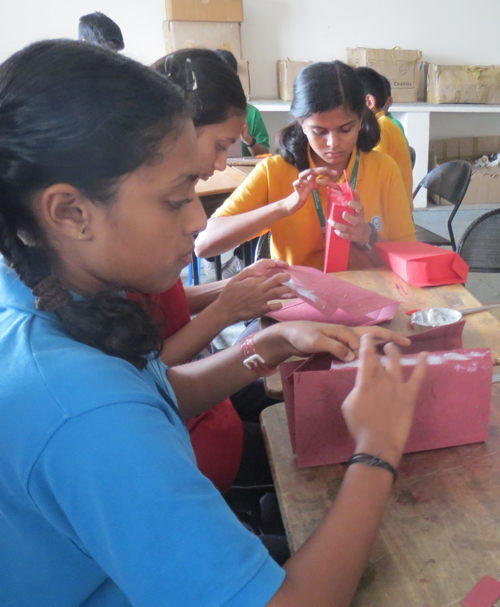 The students of Lalaji Memorial Omega International School use the paper plant set up for this purpose to manufacture handmade paper out of waste paper and cloth generated from our administrative offices and hostel facilities. At the Paper Plant, pulp is first created with a combination of the collected waste paper, dry leaves and cloth and passed through specialised machines like the Rag Chopper and Hollander Bitter. The extracted pulp is processed further to create sheets. During the sheeting process, our students showcase their innovative ideas by applying patterns with dried leaves, thread, vegetables, flower petals and more. Once the excess water has been drained, the sheets are sun dried and later cut into appropriately sized sheets of paper. This handmade paper is then converted into aesthetically designed stationery and other products. The paper plant also utilizes leaves and herbs collected from around the campus, and natural and other dyes to produce designs that are attractive to the eye. The stylized products are used in our offices and are also available for sale. All through the year students learn to recycle waste paper and cloth during their periods allotted for LSA and Co-curricular Activities.